I knew the internet held the answer in some way. But I just didn’t know how. Prior to my petcare business taking off I’d tried a few things online ... “lifestyle” blogging, opening an Etsy shop (trying to sell blinged-out pacifiers … seriously), and I’d been consuming online marketing info for as long as I could remember. My bookshelves, podcast archives, and the download folder on my laptop were full of the stuff. So much consumption. Yet so little action, up until now. So I went back to the drawing board again. I tried booking honeymoon trips for newlyweds. I offered business strategy consultations. I designed, and redesigned, and redesigned again my website. Some things worked. Some didn’t. But nothing truly lit my fire. Nothing grabbed me as being “IT”. Finally, while I was still floundering around, I wrote this blog post in which I explained the Pinterest strategy that I’d used to book clients for my honeymoon travel business, and I entered it into a blog contest on Blackburg Belle blog. Out of 63 entries, I was one of the 5 choosen winners. What I wrote actually mattered to someone??? Suddenly I had people visiting my website. I had 20 comments on the post in a matter of days. I was receiving emails letting me know how encouraging and helpful my post was to them. People were actually signing up for my email list. And most importantly, I finally saw myself as having a skill that mattered. I realized that I knew something that wasn’t common knowledge. And I knew how to share it in a way with others that mattered. That little win was the difference between me giving up again and actually giving this a shot. In that moment, I’d found my niche. My reason. My people. What I was to be known for. And I kept moving forward was my new found focus as a “Pinterest expert”. I spent 2016 and the first part of 2017 trying to do all the “right” things…. 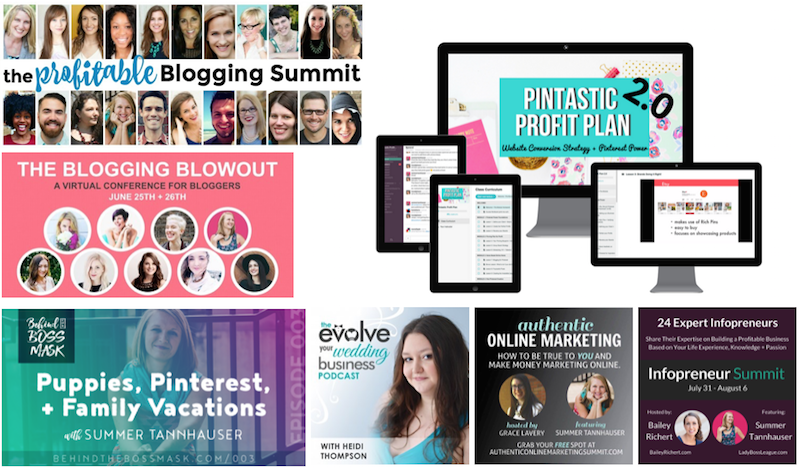 --> Building my email list through a free Pinterest course that I developed as my “signature” opt-in freebie. --> Taking on Mariah Coz and other influencers as beta testers of my Pinterest strategy services. --> Developing an online course of my own and selling it for $97 to the tune of a $5K first launch and then later scaling up to five figure launches. --> Starting to see opportunities come my way …. being featured on Teachable, on Inc.com, and on multiple summits and podcasts. My name became a go-to resource whenever people inquired about Pinterest marketing. Things were going fairly swimmingly. And I had “all the things” going on. I’d dabbled in using Facebook ads …. But in reality my world was spinning out of control.